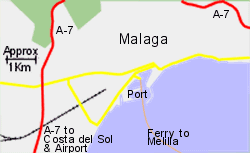 Map of the Malaga Ferry Port area. 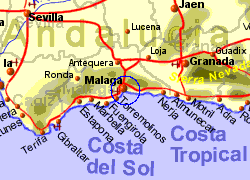 High speed trains run from Malaga to Madrid while regional trains run on a coastal line as far as Fuengirola, via the airport which is approximately 8km from the port. The station is with 1Km of the port area. 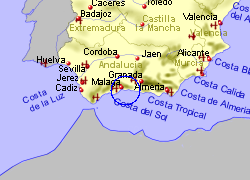 The A7 motorway gives good acces east and west along the Mediterranean coasline. Operated by Acciona with up to 6 crossings per week, crossing time approximately 7.5 hrs.